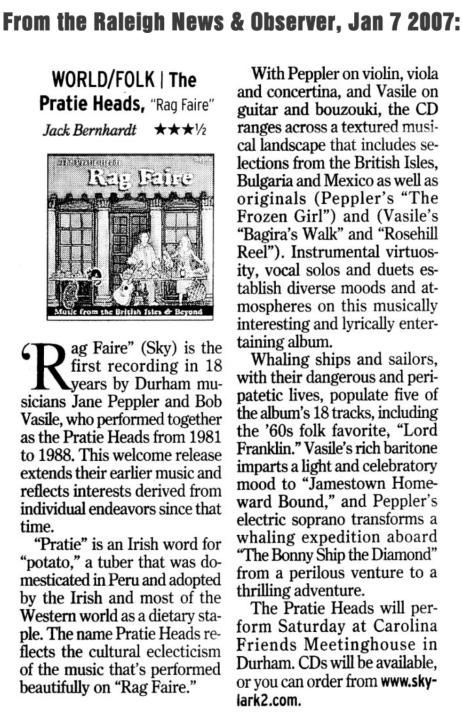 Their repertoire: "More or Less Traditional Music of the British Isles and beyond." They were long-time members of the Touring Artists Program of the North Carolina Arts Council. 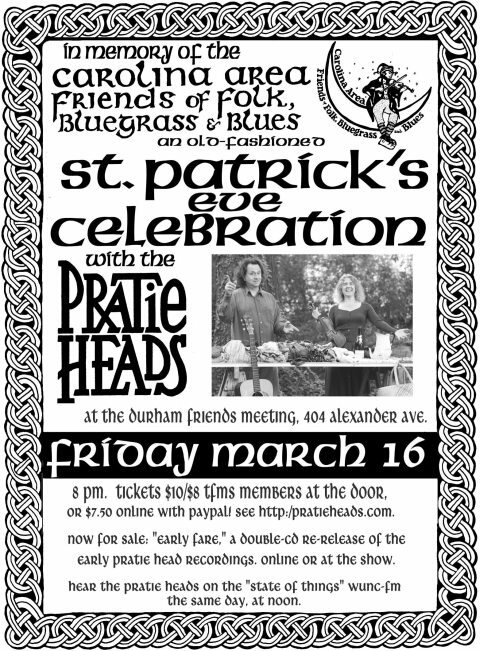 "The Pratie Heads were their state's premiere performers of British Isles traditional music ... they have made some of the best Celtic, English, and early American folk music available in recorded form. 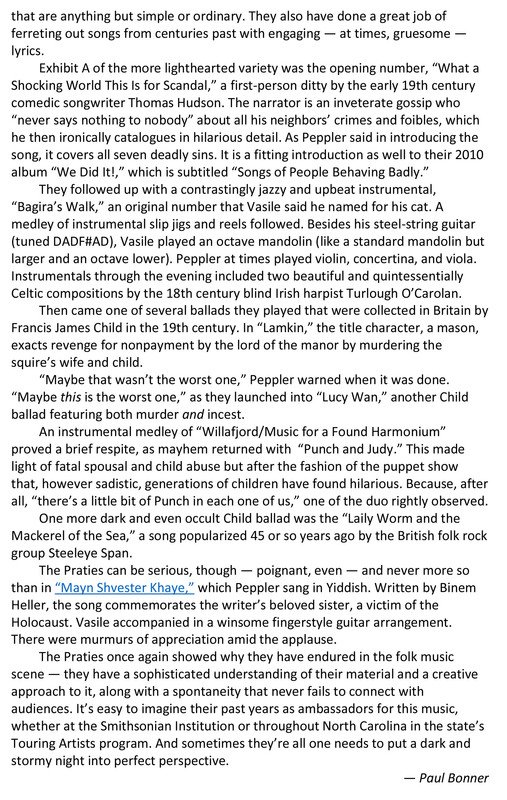 They have picked beautiful, uncommon songs to play, have thoroughly researched tunes and texts to produce the best possible versions, and have lovingly and impeccably arranged them. And still it emerges as spontaneous, joyful music - it's a rare gift they have. 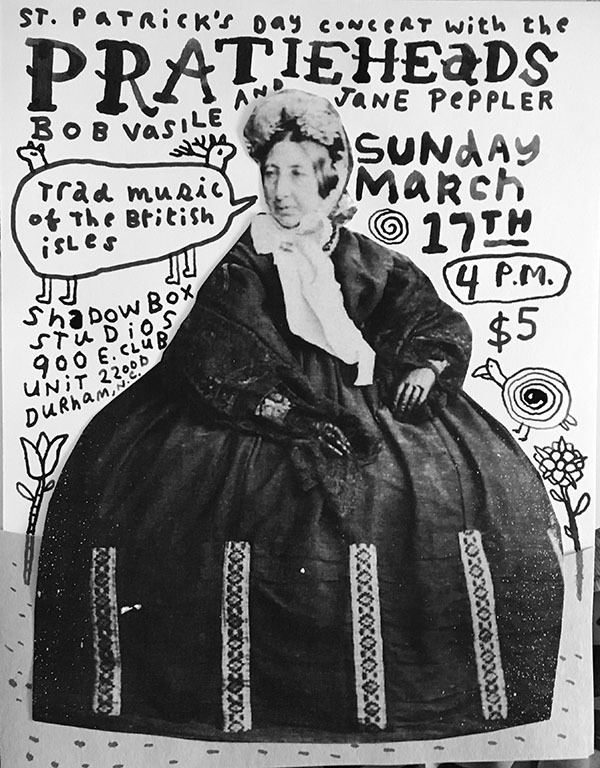 ... Peppler's voice is a clear soprano wonder with a feeling of intense but controlled wildness that she may owe to her training in Slavic and Balkan singing ... as amazing on fiddle as she is singing, [with] great tone on the slower tunes and real speed on the quick ones. My suggestion is to buy a copy of each tape, and then make a dub of each. Put the originals away in a cool, dark place and play the dubs. That way, when you've worn out your copies, you can repeat the process without having to pay for more tapes. Don't say I didn't warn you." From our Centerfest appearance, September 2009; Jim Baird, bassist with Mappamundi. Thanks for a fantastic performance. Bob (and Jane), I was hoping to see you at our favorite breakfast haunt so I could thank you in person but now I don't want to delay sending you and Jane my sincere thanks for a fabulous performance for our annual Triangle Guitar Society holiday salon recital. We've always enjoyed your many performances for us in the past mostly in a solo format but with Jane Peppler as your duo partner I believe you have a fantastic synergy of talents and a fine ensemble that's as expressive as it is flawless. With your your fantastic originals and your special unique arrangements there's no limit to your success. I have heard many compliments from our TGS folks how blown away they were to find that Jane sang perfectly in Spanish and with a seductive charm as well. Starting off with the eastern European sounding piece Daichovo Horo was a smash hit. It was great to hear the duo version of Boutros the Cat. And Bagira's walk owes a lot to Dadfad in Bagdad and you know I love that special style. Perhaps this piece should be our next transcription project. And I especially love your new murder ballads and yes you're a great singer too. Lord Franklin is so tender and sweet that on first hearing I already feel nostalgic. And I think your next album after the murdererous ballades should be entirely devoted to your own compositions as they are always my favorite pieces when I hear you play. Already we are planning to get you guys back in one of our public concerts soon. 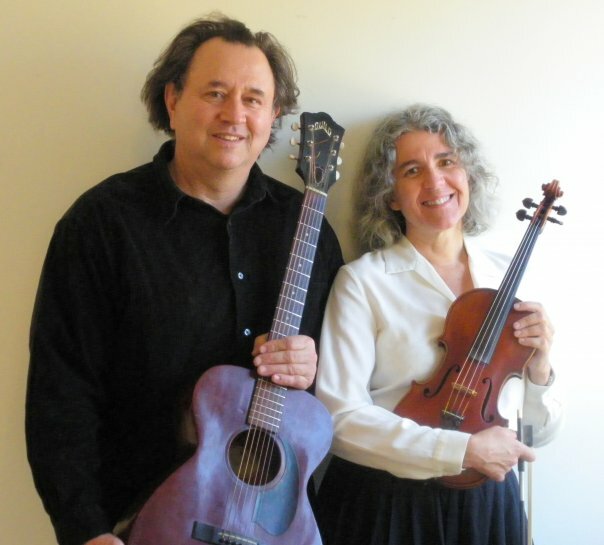 With the gypsy seduction of Jane's playing and singing and your special exciting style of guitar and bouzouki and fantastic tender singing your duo deserves to be heard far and wide and I congratulate you both on achieving such a fine accomplished ensemble.